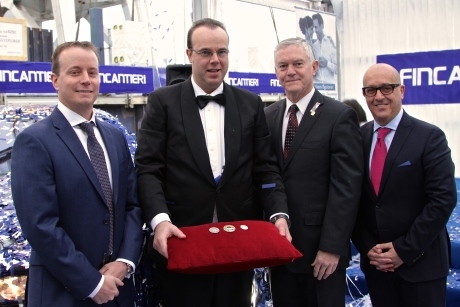 The first building block for Seven Seas Explorer was placed during a special keel laying ceremony at the Fincantieri shipyard in Genoa, Italy. The keel laying signals a significant milestone in the construction for what will be the most luxurious ship ever built, and brings the vessel one step closer to its 20 July 2016 maiden voyage. Jason Montague, president and chief operating officer for Regent Seven Seas Cruise, Robin Lindsay, executive vice president of vessel operations and Franco Semeraro, senior vice president of hotel operations welded the coins into the ship's keel before the building block was lowered into place in the dry dock. "With construction beginning in earnest today, we took a major step closer to realizing our vision, to provide our guests with a vessel that will be hailed as the most luxurious ship ever built," said Montague. "Every inch of the Seven Seas Explorer will exude elegance and grandeur, and that extends to all aspects of the ship from the lavish suites to the gourmet restaurants and stylish public spaces. We even ensured that the keel coins convey a sense of luxury." At 56,000 gross-registered tons and carrying only 750 guests, Seven Seas Explorer will boast one of the highest space ratios in the cruise industry and among the highest staff-to-guest ratio, further strengthening Regent Seven Seas Cruises' widely recognized position as the leader in the luxury cruise segment. World-renowned architectural interior design firms Tillberg Design AB, RTKL Associates and ICRAVE are designing the vessel. Seven Seas Explorer will join the award-winning Regent Seven Seas Cruises fleet in the summer of 2016.